Not a fried Mars bar in sight! Scotland has some of the most beautiful and dramatic scenery in the whole of the UK. The mountains soar straight into the sky and are topped with snow even in sunny weather, the fields are lush and green and the lochs permeate the landscape like intricate lacework. The air is clean and so is the water, so naturally the produce is already at an advantage. We started our Scottish road trip in Edinburgh. Not too far from the border, this friendly city manages to balance the cosmopolitan with the traditional and is the perfect starting point for a Scottish adventure. There are some highly regarded restaurants here. Some deserving of their reputation and some that seem to be resting on their laurels. On our first night we dined at the relatively new Timberyard, a restaurant that prides itself on sustainability and uses local artisan growers and suppliers. With a warehouse and open plan feel, this place is so trendy it hurts. It is not however, a case of style over substance. We opted for the tasting menu with “drink pairing”. 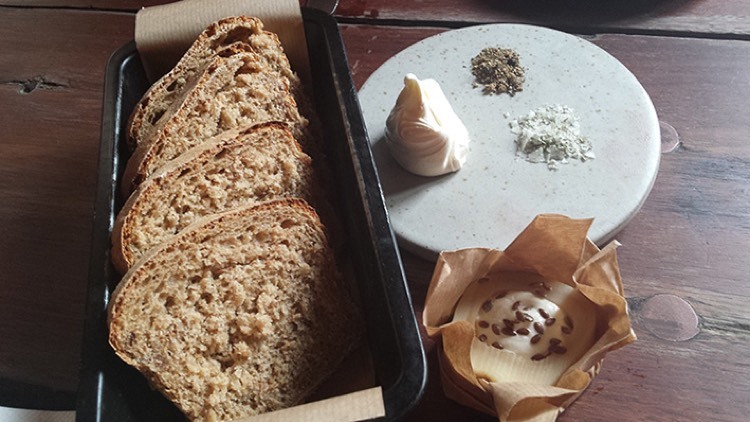 The menu is seasonal and perfectly executed from the individual loaf of freshly baked bread with bone marrow and whipped butter (sea salt and crushed pepper on the side) to the exquisite sea buckthorn, carrot, crowdie and buttermilk dessert. Service was friendly yet informed and our sommelier Jack was a fountain of knowledge when explaining our quirky liquid accompaniments. Not just wine but cider, mead, and even a very unusual curds and whey (interesting, but not sure the world’s quite ready for that one yet). This meal set the bar pretty high for our expectations of Edinburgh’s dining scene but our meal the following night at the famous Witchery restaurant sadly ranged from poor to mediocre and we left halfway through the main course, disappointed, and feeling that this once shining jewel had now lost it’s sparkle. The Ubiquitous Chip (contemporary Scottish cuisine) and The Grill on the Corner (fabulous steaks and even better service) are both great places to eat. The Ubiquitous Chip is in a small, funky little street near the University Campus that did almost tapas size portions of traditional Scottish food, so it’s ideal for those wanting to experiment. The next destination was Oban. Scotland, particularly the highlands, is renowned for world class seafood and fine malt whisky and Oban is the perfect place to sample both of these. The Oban seafood hut located on the Calmac pier is an Oban institution and serves indulgent seafood platters to either eat there at the outdoor communal table overlooking the harbour or to take away. They also serve garlic mussels or whole lobsters served with butter and sauces, cooked to order. After our first visit we were hooked and this became the only place we wanted to eat at for the rest of our time there. We did however, have to have the battle of the Fish and Chip Shops. Having seen one that said it was the “Best in Town” and another that was classed “Best I’ve Ever Tasted” by Rick Stein, we had to see which was best. Leigh-ann got the best in town and I got Rick’s favourite, then it was off to the beach to see which came out on top. Mine was crispier and lighter, but Leigh-ann’s were all cooked in beef dripping, which really added to the flavour, and whereas mine was made from frozen fish, Leigh-ann’s were from the mornings catch. Turns out the “best in town” trumps Rick Stein! The whisky distillery is also worthy of a visit and they have a lovely little tasting room that lets you try a varied selection of Scotland’s different single malts for a very reasonable £3 a dram. An enjoyable way to discover your own favourites on the whisky map. We were then off to the beautiful island of Lewis with spectacular beaches that wouldn’t look out of place in South East Asia (albeit with a very different climate) and where the sheep outnumber the people. As soon as we arrived, we headed to the local butcher and bought some beef ribs, which they call boiling beef and charge half what they do in London, and a shoulder of lamb. We were holed up in quaint little Iron Age cottage with views over the beach which, though advertised as self-catering, left much to be desired having only a two ring electric burner, a microwave and a small, wood burning stove. As a rule, I refuse to use microwaves, so I had to work out how to cook the things I had bought with the equipment I had. The first night, I cooked the beef ribs. I braised them for 3 hours in a seasoned broth, then another 30 minutes in a barbecue sauce that I spiked with Oban Whisky to give it a Scottish twist, then finished them off with a bit of a char and smoking session in the wood burner, with a mix of hay and peat as the fuel. They were absolutely fantastic. I was so proud of my creativity and resourcefulness that I was then emboldened to try and do some sort of barbecue/roast with the lamb shoulder. On this one, I really won’t go into the detail of how I made it. Suffice to say, it was an unmitigated disaster. For the remainder of trip, I decided to curb my creative impulses. didn’t have employees and owners, instead, everyone owned the business and worked on a kind of voluntary basis. It sounded fascinating in principal, so I went to see how it worked in reality. The reality was, it didn’t work. They had tried the model for a while, but it turns out that even volunteers need a bit of leadership and direction and a business does have to be taken seriously and operated professionally, which they just weren’t able to do. Though they rather naughtily hadn’t updated their marketing collateral, they are now a conventional restaurant owned by investors and run by employed managers. I was a bit relieved, as I found myself panicking that if this kind of thing really did work, people like me would be out of a job! The restaurant was okay, serving some real comfort foods. Mac and Cheese with chips seems to be a common thing for carb lovers in Scotland, which was strange to see. They did have some great puddings though, with a very indulgent and gooey chocolate and Guinness cake and a cranachan panna cotta that was brilliant. The Mustard Seed was our next stop for dinner and we found it both reasonably priced with good food and service. Back to simple food, well prepared, with amazing produce. Fantastic mussels whilst taking in some great views of the river. Scotland is a fabulous foodie destination that manages to showcase its produce against a backdrop of stunning scenery and friendly locals. The one thing it really brought back to me was the fact that, when you have amazing quality, don’t try to be too fancy. The ones that get it right never do anything to prevent the produce being the star of the show. Simple and yet luxurious, and not a fried mars bar in sight!